How to delay a “not gate oscillator” to make it run at a desired frequency? My question is: How do I slow down the output of the "not gate oscillator" (Diagram 1), to the desired output of(0.75 seconds "on" and 0.75 seconds "off") and is this frequency 0.75 Hz? This tends to work better with a Schmitt-trigger NOT gate (one with some hysteresis, or difference between "voltage it changes state on when going down" and "voltage it changes state on going up.") Circuit-lab's logic selection does not appear to have any Schmitt-trigger parts. Incidentally a Schmitt-trigger NAND with the inputs tied together also makes a Schmitt-trigger NOT. It's a crude solution in any case and the R, C values are highly unlikely to give the precise oscillation you want. A 555-timer or 555 timer into a flip-flop is a somewhat less crude approach. You can add some components to the circuit as shown below to make your LED blinking oscillator. Make sure to use a chip like a 74HCT04. If the frequency does not come out just where you want it you can experiment with changing the capacitor value or the R1 and R2 value. Once again make sure to use a CMOS type NOT gate part for the three inverters. The part suggested above actually as six inverters on one package. Not the answer you're looking for? 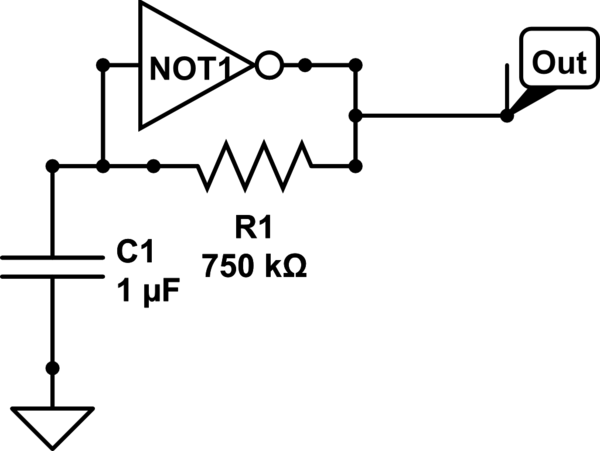 Browse other questions tagged frequency clock logic-gates or ask your own question. What can cause an oscillator output voltage to go higher than expected? How can I find the frequency of oscillation of this sawtooth oscillator circuit?